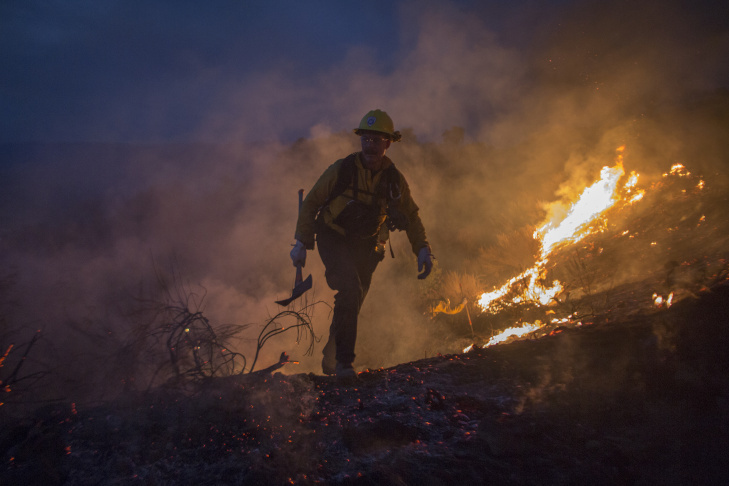 A firefighter climbs a burning hillside while fighting while the La Tuna Fire on September 2, 2017 near Burbank. Firefighters clear brush above Cabrini Villas in Burbank as they fight the La Tuna Fire on Sunday, September 3, 2017. 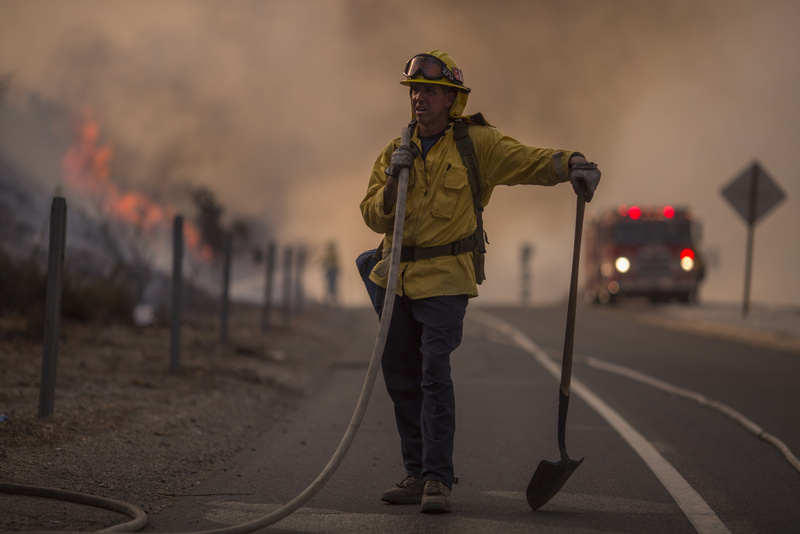 A firefighter fights flames in chaparral brush using only a hand tool at the La Tuna Fire on September 2, 2017 near Burbank. Flames rise from the La Tune Fire on September 2, 2017 near Burbank. 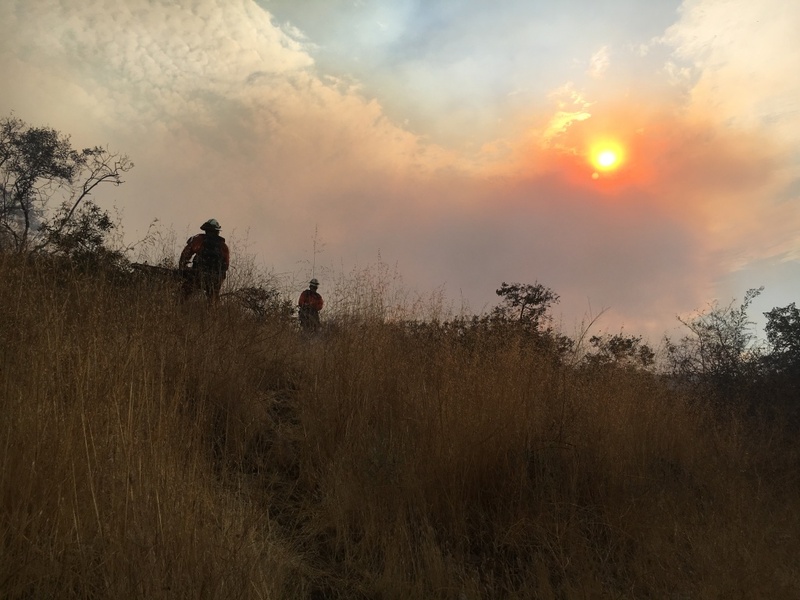 Firefighters use hand tools in chaparral brush to fight the La Tuna Fire on September 2, 2017 near Burbank. 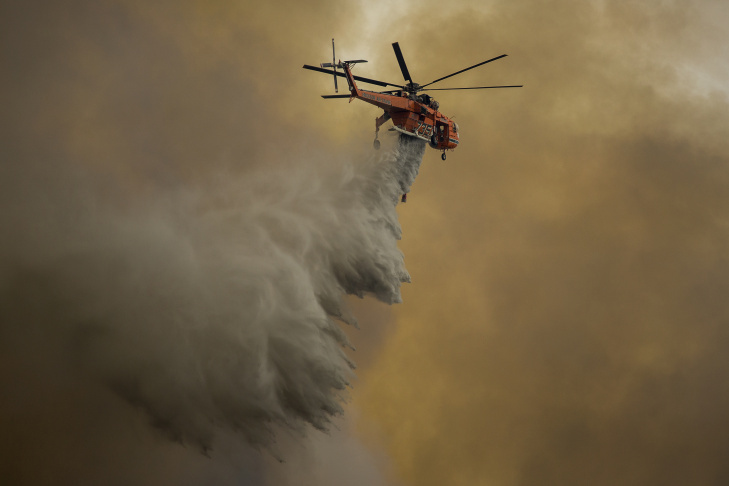 Firefighters use hoses and helicopters to fight the La Tuna Fire on September 2, 2017 near Burbank. An Erickson Air Crane firefighting helicopter drops water over the La Tune Fire on September 2, 2017 near Burbank. California Gov. 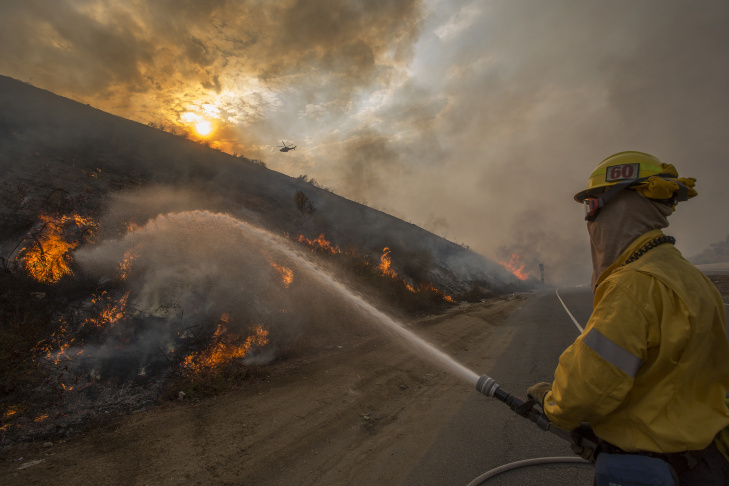 Jerry Brown declared a state of emergency for L.A. County Sunday, as the La Tuna Fire held fast at 7,003 acres in the hills above Burbank, Glendale and Sunland-Tujunga. 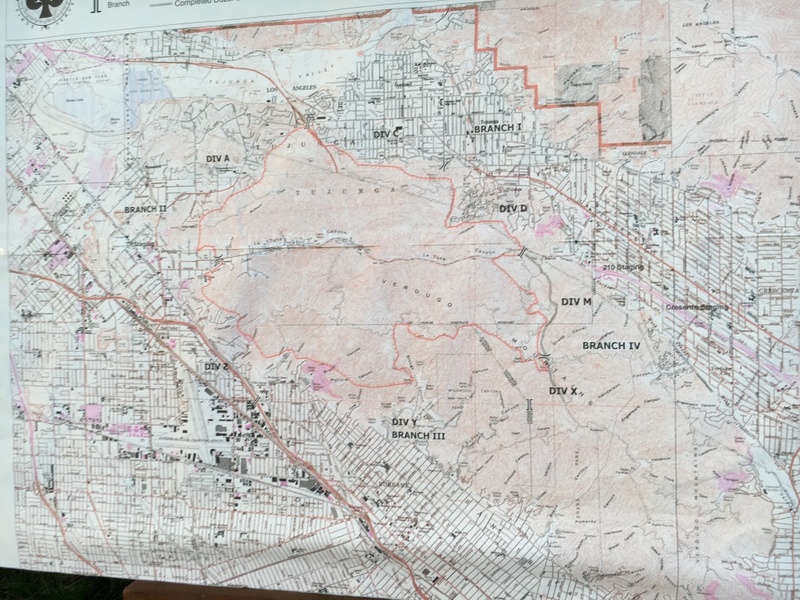 Brown's declaration frees up state and federal resources to battle the fire. The Governor’s Office of Emergency Services secured a FEMA grant on Saturday to help fight the La Tuna Fire. 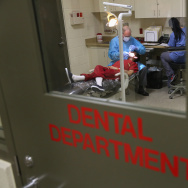 The grant lets local, state and tribal agencies recover eligible costs. As of Sunday afternoon, the La Tuna Fire was 30 percent contained. 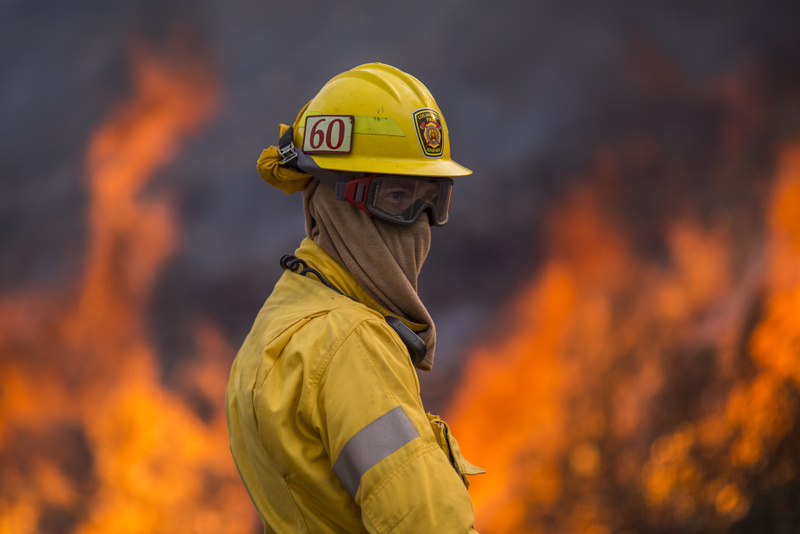 It'll take another three to four days to achieve 100 percent containment, but conditions have been favorable, Los Angeles Fire Department chief Ralph Terrazas said. 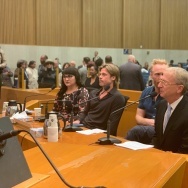 "We were very fortunate today. We actually had a pretty good downpour for a few minutes, but it also brought some erratic winds." Terrazas said. "It's kind of a mixed blessing." 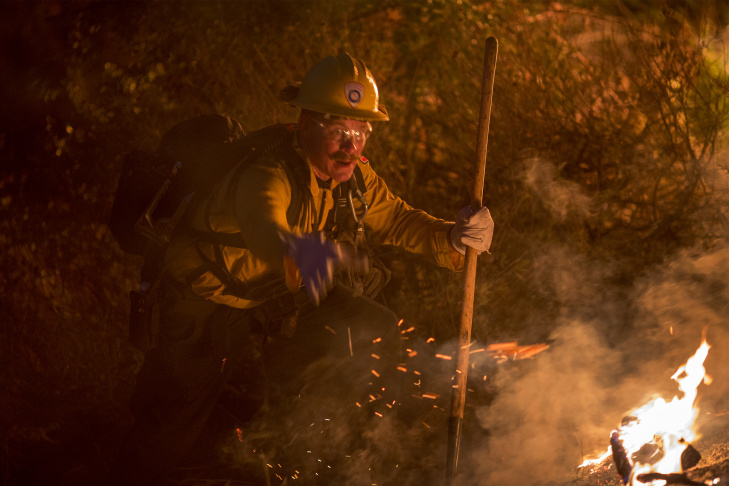 More than 1,000 firefighters are battling the La Tuna Fire. So far, four firefighters have been injured, including two from dehydration, one with minor burns and one from an allergic bee sting. Three homes and one shed have also been destroyed. 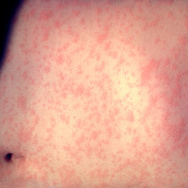 “Considering something of this size, it’s really a miracle,” Los Angeles Mayor Eric Garcetti said at an afternoon news conference. 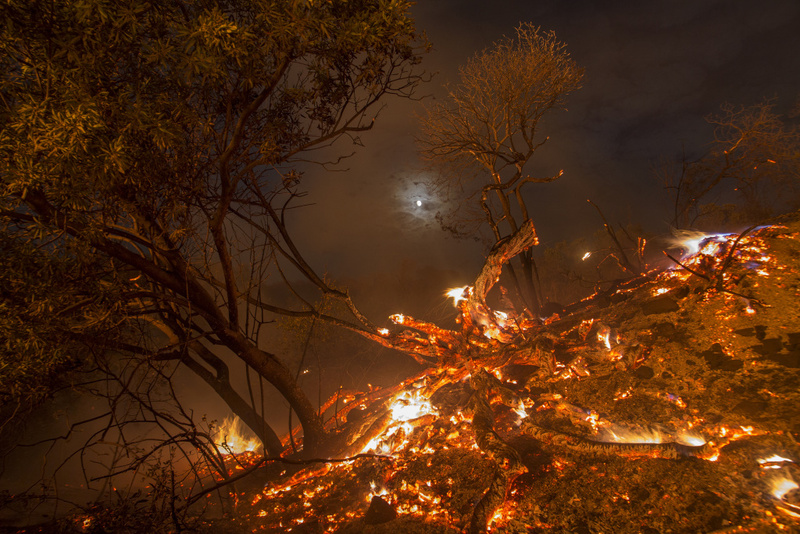 Flames spread on a moonlit night at the La Tuna Fire on September 2, 2017 near Burbank. The mountains of Los Angeles, Ventura and Santa Barbara counties, as well as the Santa Clarita, San Fernando, San Gabriel, Antelope and Santa Ynez valleys were under a flash flood watch, with possible rainfall rates of more than one inch per hour, according to the National Weather Service. The weather remained the top concern for firefighters. “We’re concerned today with this moisture,” said Los Angeles County Deputy Fire Chief John Todd. 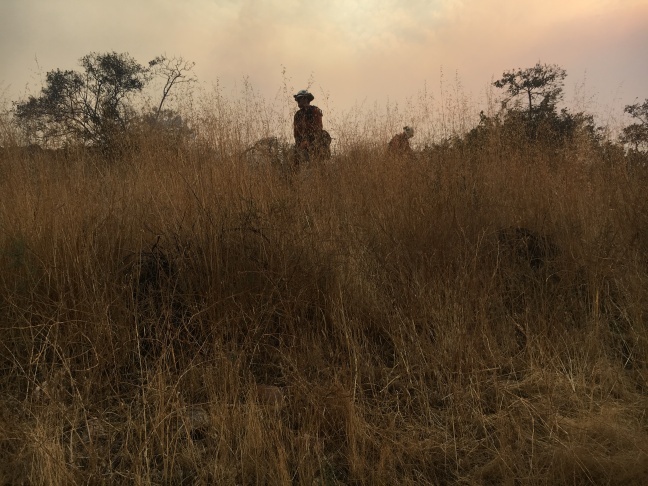 "Moisture is a good thing, because it brings up the humidity and the chance of rain is a good thing, but also with thunder cells we could have lightning and we could have downdrafts that could blow the fire in any direction." Thunderstorms over burn areas also increase the chance of debris flow, the National Weather Service warned. 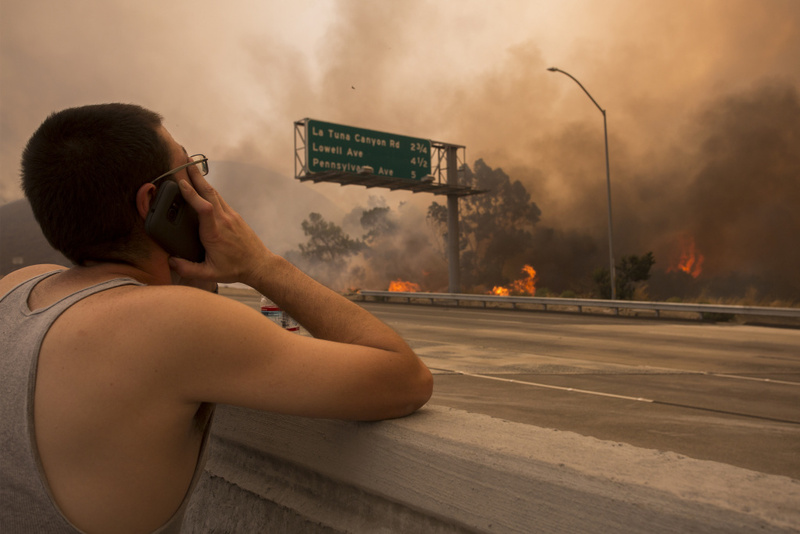 A firefighter stands on the 210 freeway during the La Tuna Fire on September 2, 2017 near Burbank. Mandatory and voluntary evacuations in Glendale and Los Angeles were lifted by 6 p.m., officials said. Burbank Police had issued new mandatory evacuation orders, after a flare-up near Burbank Estates and Castleman Lane. Those orders were lifted at about 4 p.m. Voluntary evacuations were still in place for areas of Burbank, including Country Club Drive, east of Sunset Canyon. Residents of Lamer Street in Burbank expressed relief Sunday that the worst risk to their homes appeared to have passed. Across the street, neighbor Albert Flynn said he and his family stayed away from their home, returning late Saturday once it appeared the fire had been beaten back. 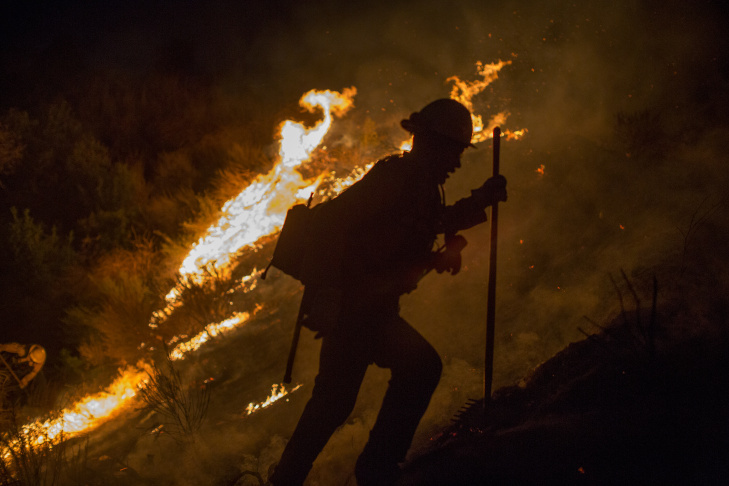 Flames rise behind a firefighter at the La Tune Fire on September 2, 2017 near Burbank. The 210 Freeway reopened in both directions by late Sunday, according to LAFD. A map of the burn area for the La Tuna Fire on Sunday, September 3, 2017. 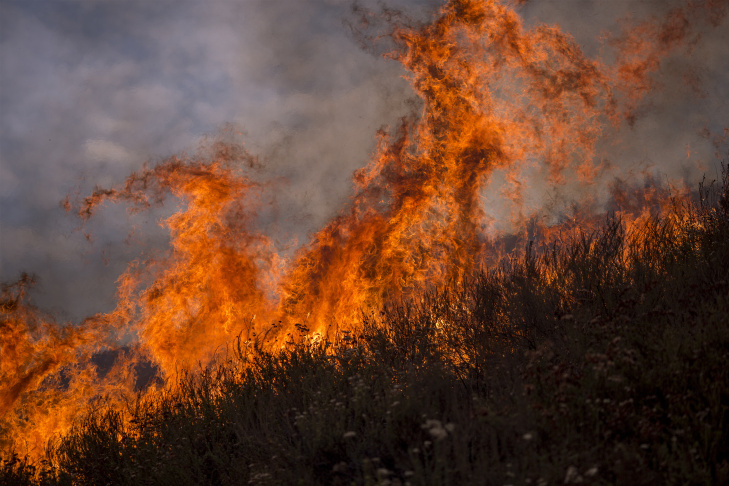 Garcetti declared a local emergency on Saturday because "The magnitude of the conditions resulting from this wildfire has exceeded normal services, personnel, equipment, and facilities." He also asked Gov. Jerry Brown to declare one. 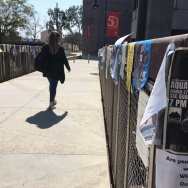 Los Angeles County expects to declare a state of emergency on Tuesday to bring in more resources, Los Angeles County Supervisor Kathryn Barger said Sunday afternoon. The La Tuna Fire remains one of the largest fires in the city of Los Angeles's history. A man watches to see if his house and two of his cats on the other side of thick smoke and flames might burn near the community of Tujunga during the La Tuna Fire on September 2, 2017.